Another year and a new WWE game has hit the market, only this time 2K has taken over control of the franchise. 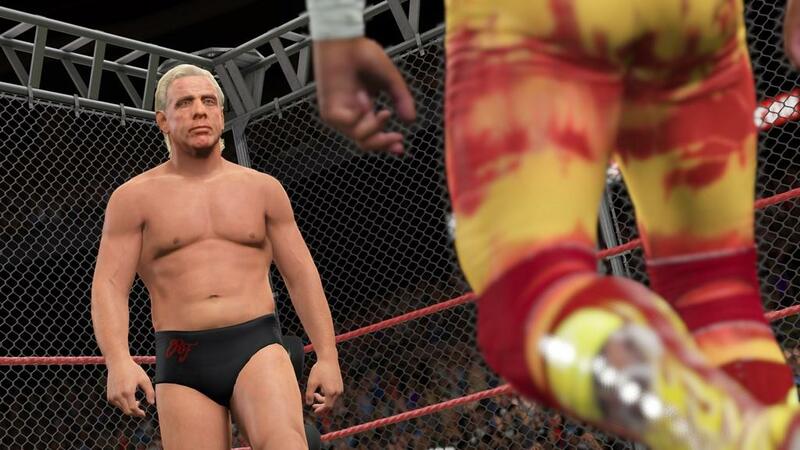 WWE 2K15 is the first WWE game to hit next-gen consoles and is the first game that was completely made by 2K. I along with many other WWE fans were excited when 2K took over the franchise. Seeing what they have done with the NBA2K games and previous games like NFL2K, it was great to hear that they would be taking over this franchise. Well, 2K did do something right. They were able to capture exactly how WWE's current product feels. Incredibly boring. One of the biggest changes you will notice as you start your first match is the upgrade in graphics. Seeing that this is the first WWE game on new consoles, it makes sense that the game would get a graphical upgrade and for the most part the graphics look great. If there is one thing 2K is great at, it's presentation and WWE 2K15 is no exception. Everything from the ring itself, which is now to scale, the crowd and the ringside area all looks fantastic and they have really done a great job to make it as close to a real WWE production as possible. The other graphical upgrade you will notice is in terms of the superstars themselves, some of which were scanned into the game making their digital versions look phenomenal. The detail on some of the wrestlers like John Cena, Randy Orton and Triple H are insane. Then you will see some of the other superstars who obviously weren't scanned into the game and they stick out like a sore thumb. The divas are the biggest example of this. Some of them look okay, but some of them like Nikki Bella look absolutely horrific. Seriously it's like something out of a horror movie. What the hell happened here? Even with all those problems, the graphics and presentation are the best part of the game. Sadly, that's about the only good thing I have to say about this game. The best way to describe their new gameplay mechanics is that the game is a wrestling simulator. At the start of the match you will notice the new chain grappling system. By hitting the grapple button, you and your opponent will end up in a rock paper scissors type game where you both fight for position and the advantage of gaining the upper hand earlier in the match. If you win the inital grapple, then you and your opponent enter the next phase where you have to rotate the thumbstick to try and find the sweet spot. Once you do your meter fills up and you will gain the advantage. In my first couple of matches, I really enjoyed this new system, but after a while you start to notice some flaws. For one, it seems like the chain wrestling system will continue until either you or your opponent take a certain amount of damage. This is fine, but the problem is that in some matches, you have have to enter the chain grappling system multiple times. Now I've watched a lot of WWE in my life and unless the match is something like Kurt Angle vs. Chris Benoit or a match that features two mat technicians, you aren't going to see that much chain wrestling. In order to try to mimic the WWE style of wrestling, the gameplay has been slowed down as well and unfortunately this is one of the biggest problems I have with this game. Controlling wrestlers feels like a chore, and the game just doesn't feel fun at all. Something as simple as throwing a punch or trying to grapple your opponent is harder than it ever needs to be. The wrestlers just don't control all that well. When you are playing a game like this, you want fact, exciting action, but when I have to wrestle with the controls, slowly watch as my characters pulls the opponent to the middle of the ring only to hit him with a suplex, it really takes all the excitement out of it. There is also a new stamina meter this year also. You need to be careful about how you wrestle as your stamina will be constantly draining throughout the match. Spam moves and you'll find that you will come to a crawl as the match goes on. Sadly, the stamina meter just feels like the new chain grappling system. It just isn't fun. It makes the matches slower and more sluggish than I feel they should be. One of the biggest additions to this years game was the brand new My Career mode. I along with others were incredibly excited about this. Finally, a WWE game with a true career mode where you start out at the bottom and have to work your way up. What could possibly go wrong? Everything. You start My Career mode by creating a wrestler (CAW), and this is where you start to see how much of a step back this game is from previous titles. While going through all of the menu's in CAW, I started to notice just how much had been removed from this game. Previous WWE games had been filled with a plethora of clothing to deck out your CAW with. This year the closed is nearly empty. Things only get worse when you try to create an entrance. Previous WWE games had tons of generic and custom entrance animations that you could give your CAW so that you truly felt like you were creating your own wrestler with their own unique personality. All of that is now gone. You can only select from the entrances of wrestlers already in the game. Even worse is that the option to create a Titantron video for your CAW is gone as well. Again, you can only choose Titantrons from wrestlers already in the game. The only non Superstar Titantron they have is if you want the WWE logo to be on the screen the whole time. I am sorry but this is 100% unacceptable. These are features that NEED to be in a WWE game if you are going to have a CAW mode. You need to be able to make your CAW stand out from the rest of the WWE roster. After seeing all this stuff removed, I honestly didn't even bother going in depth to create my wrestler. There isn't any point. At the start of My Career you start out with a bunch of other horrible and generic CAW's in the WWE Performance Center which pretty much acts as the tutorial. You get yelled at by Bill Demott while completing various objectives. Do well enough and you get moved to NXT, WWE's minor league federation where all of the future WWE stars start out. Bill Demott told me that only one person would get a WWE contract, which was obviously a lie because as you start NXT, you'll be facing off against those horrible, generic CAW's again that you started off against in the training center. As you progress through your career you'll win points which can be used to upgrade your characters attributes and VC or Virtual Currency which can be used to buy abilities, moves, and clothing for your character. Again though, I have a hard time even caring about my wrestler when I can barely customize anything about this. The main problem I have with My Career is that, even in the beginning, it really doesn't feel like anything I do matters. For instance, I won my first three matches. Then I was paired up against Bo Dallas and lost horribly. This was an absolute burial and my post match rating was a half star out of five or "bad" as they call it. Then I have William Regal telling me "that was a great match, I'm giving you a shot at the NXT title next week". This happened on more than one occasion as well. I lose matches, and get rewarded with title shots and pushes. It also doesn't really feel like anything you do has any meaning. You get "social media" followers for all your matches, and you do get choices as to who you want to face, but there is no drama here. It feels like you are going down the exact same path no matter what you do. The one place where WWE 2K15 does shine however is the 2K Showcase mode. Like Attitude Era mode and 30 Years of Wrestle Mania last year, 2K Showcase is the single player story mode this year where you get to play though two of WWE's biggest rivalries. Hustle, Loyalty, Disrespect showcases CM Punk vs. John Cena, starting with their classic match at Money in The Bank 2011 and Best Friends, Bitter Enemies showcases Triple H vs. Shawn Michaels from 2002-2004. In each match you will have objectives to complete based on actual moments from said matches. Completing objectives will earn you rewards such as unlockable arenas and characters. At certain points during the match, the game will transition into cutscenes based on the biggest moments from the matches in the Showcase and I have to say that they look great. The commentary, the crowd and the motion capture do a great job of presenting the drama in those matches. Both Showcases also feature video packages from the amazing team at WWE headquarters and really add to the drama of the matches. My only complaint with this mode is that some of the matches in the Showcase are questionable. You could go from a classic match like CM punk vs. John Cena to something like John Cena vs. Big Show in the main event of Raw. At this point I couldn't think the game would get any worse. Oh boy it did. I mentioned before about all of the missing features from Create a Wrestler, but it doesn't end there. Create an Arena, Create a Finisher, Create a Championship, Create a Story and even the ability to create Divas is all gone. The Creation Suite is always where I spent most of my time in this game and seeing all of these great features being removed was a huge punch in the gut. I can understand if 2K wants to bring these features back in the future and even better than before, but that doesn't help me now. Pretty much the only creation mode you get in this game is the ability to create a wrestler and as I mentioned before, it has been completely gutted. But wait! There's more! Take a look through all the list of match types available in the game and you will see that a gigantic list of match types have been removed from the game as well. You can have a 1 on 1, 3 way, and 6 way Hell in a Cell match, but you can't have a 4 way? Why not? Even worse is that the simplest of match types like Tornado Tag Matches is gone. Or is it? While I'm playing WWE Universe mode, the CPU books a Tornado Tag Match, but I can't select it in exhibition mode? I can select an Iron Man Match, a match notable for having wrestlers square off against each other in a 60 minute match, but I can only have 15 minute Iron Man Matches in this? The TLC match is in the game but normal Ladder Matches aren't? What the hell happened with this game? This is completely inexcusable. These matches were incredibly fun and once again just completely killed buzz for the game. 3/4 way TLC matches? Steel Cage matches? Tag Team TLC matches? Tag Team Tables Matches? All gone. It's at this point that I realize that annual releases of games needs to stop immediately because its apparent this is an unfinished game. This is not acceptable at all. 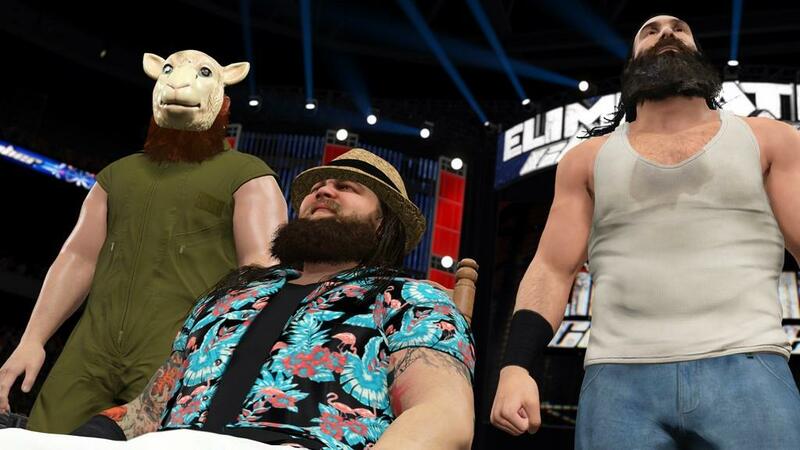 WWE 2K15 feels like one step forward and ten gigantic steps back. I will give 2K credit for what they tried to do and I feel like foundation has been set for future games to be great. Keyword "future". As it stands now, WWE 2K15 is one of the biggest disappointments I have ever played in my life. This game had so much potential and misses the mark on just about everything. The new gameplay elements had potential but end up just being incredibly frustrating. That, along with all of the missing modes from previous games just make me realize how much of a step backwards this game is. Not a very good first impression 2K. Not good at all.